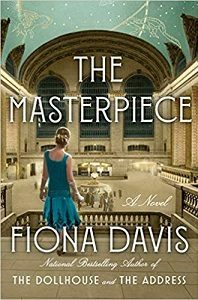 A book cover with the words “The Masterpiece ~ A Novel ~ Fiona Davisa” The cover image is of the back of a woman looking at a large, ornate room, with something bright in the center. Source: Amazon.com. This use of a low-resolution image of a book cover is considered Fair Use.